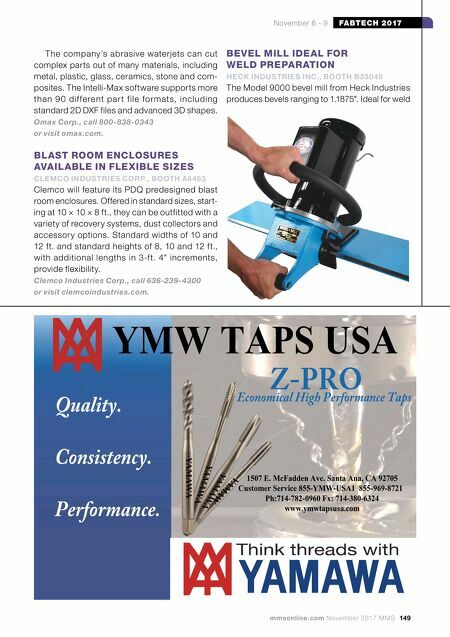 148 MMS November 2017 mmsonline.com FABTECH 2017 November 6 - 9 deburring sheet metal. At the Additive Manufacturing Pavilion, the company will show its TruPrint 1000 laser metal fusion system for complex parts, as well as its TruLaser Cell 3000 laser metal deposition system. The company will also display its TruLaser Tube 5000 fiber tube cutting machine at the Tube and Pipe Pavilion. The machine uses solid-state lasers for short processing times and a range of pos- sible tubes and profiles. Trumpf Inc., call 860-255-6000 or visit us.trumpf.com. 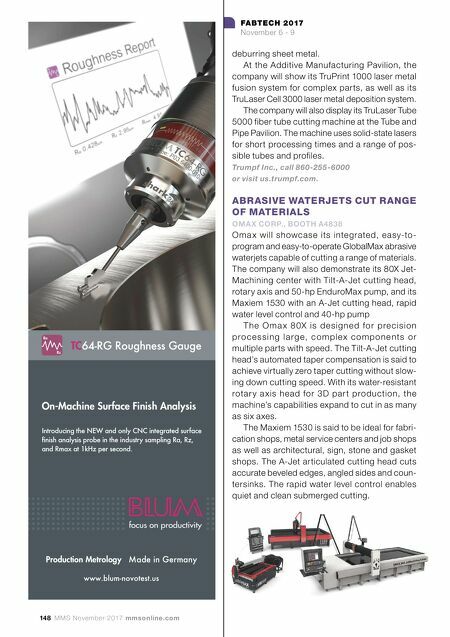 ABRASIVE WATERJETS CUT RANGE OF MATERIALS OMA X CORP., BOOTH A4838 Oma x will showcase its integrated, easy-to- program and easy-to-operate GlobalMax abrasive waterjets capable of cutting a range of materials. The company will also demonstrate its 80X Jet- Machining center with Tilt-A-Jet cutting head, rotary axis and 50-hp EnduroMax pump, and its Maxiem 1530 with an A-Jet cutting head, rapid water level control and 40-hp pump T h e O m a x 8 0X i s d e s i g n e d fo r p re c i s i o n p ro c e s s i n g l a r g e, c o m p l ex c o m p o n e n t s o r multiple parts with speed. The Tilt-A-Jet cutting head's automated taper compensation is said to achieve virtually zero taper cutting without slow- ing down cutting speed. With its water-resistant rotar y a xis head for 3D par t production, the machine's capabilities expand to cut in as many as six axes. The Maxiem 1530 is said to be ideal for fabri- cation shops, metal service centers and job shops as well as architectural, sign, stone and gasket shops. The A-Jet articulated cutting head cuts accurate beveled edges, angled sides and coun- tersinks. The rapid water level control enables quiet and clean submerged cutting.